Asparagus…harvest time is now in the Okanagan and ohhh so delicious! Our favorite recipe is to simply rinse then snap off the tough bit which is usually not much when fresh and in season locally, then lay them side by side on a parchment lined cookie sheet, drizzle with a little olive oil, top with cracked pepper and roast for 5-7 min for thin stalks, 10-12 min for medium to thick stalks at 350 degrees. They should be tender crisp and can be served hot or used in a salad cold the next day. We also like them steamed. Rinse and snap just as before. Place in a large saucepan with just a little water in the bottom, not to cover the asparagus. Bring water to a boil, then turn off the stove and remove the pot from the heat. Do not open the lid, just let them steam for about 3-5 minutes. Drain, and serve with fresh squeezed lemon juice, cracked pepper and some minced garlic. 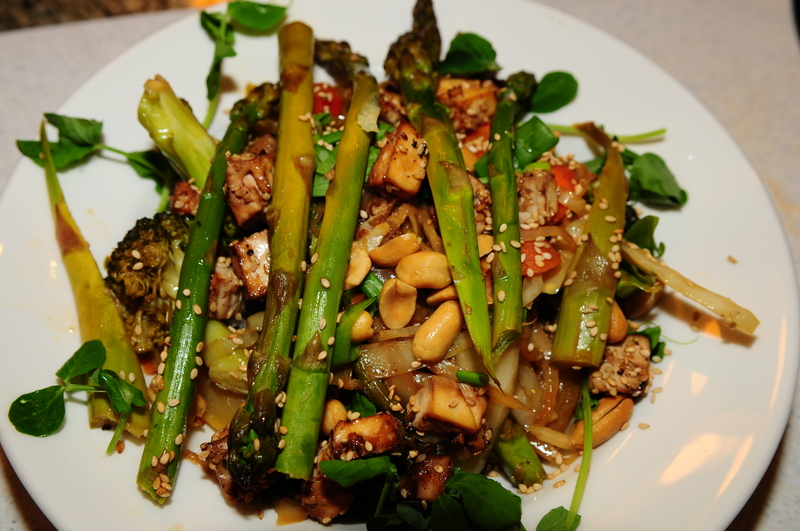 Or add them to a stir fry… this recipe uses lots of vegees which you can change up to add or remove your favorites. Asparagus takes center stage. Use lots while it is fresh and in season. Enjoy and as always, it is great knowing exactly what went into the meal. In a non-stick skillet or wok, heat oil over medium-high heat and cook the white parts the green onion for 30 seconds. Add the all the vegetables except the broccoli and asparagus. Stir fry for about 5 minutes. Mix together in separate bowl the stock, soy sauce, sesame oil, add to the wok and let cook for a few more minutes. Add the broccoli and asparagus and let steam until tender-crisp. Add garlic and ginger. Toss. Drizzle vegetables with rice vinegar, sprinkle green onions and sesame seeds and add cooked tofu cubes. Serve hot over steamed brown rice. Posted in Eat Your Greens, Salads and More, Health Matters, Recipes, What's for Dinner?